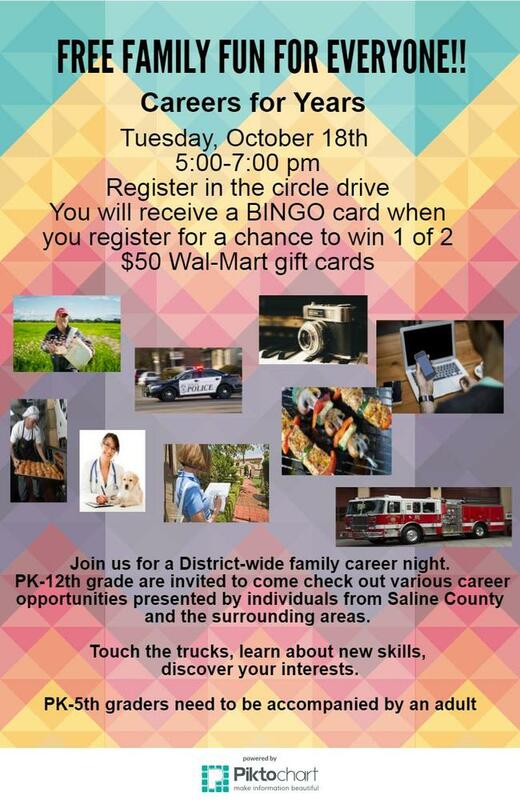 Slater Schools is proud to announce the first district-wide career night to be held on October 18, 2016 from 5-7 pm. The event, called "Careers for Years", will bring in a variety of careers, professionals, and businesses to provide interactive experiences for students and their families. Demonstrations will include vehicles and large equipment in the circle drive in addition to tables and booths inside. "We're focusing on life-readiness for our students; what it takes for them to be successful after they graduate," said High School Principal Jessica Clements. "This is a great way not just to tell them, but show them the variety of careers available, ranging from no training after High School to advanced degrees." In addition to the exposure to careers, students and their families will be eligible for door prizes throughout the night, donated by presenters, as well as two $50 Wal-Mart gift cards. To be eligible for prizes, families must register in the Central Office/Library Foyer. This is the third year for Parent Involvement nights, but the first to include the Junior High and High School. "We want to offer an opportunity for parents and students to come in to the school and learn about things together," said Elementary and Junior High Principal Becky Drummond. "This was a perfect opportunity to include the whole district." While the staff has been working to secure a variety of presenters, any adults or businesses interested in presenting in this event are encouraged to contact Mr. Robert Pannell (rpannell@slaterschools.net / 529-2278, ext. 310) or Mrs. Michelle Krog (mkrog@slaterschools.net / 660-529-2278, ext. 217) before Friday, October 11. Slater School District Superintendent Debbie Gonzalez is excited about the link between the school and the community. "We are very fortunate to have such an involved and supportive community," said Gonzalez. "I'm looking forward to watching our kids interact with our community members and learn what it is that they do every day."